Posted on August 21, 2013 August 21, 2013 in Code stuff, Miscellanea and tagged switches, toggles. This post has been viewed 15561 times. Some pure CSS flat-style switches with nice structure and animations. CSS snippet coded by DesignitCodeit. A great collection of switches and toggles buttons for your mobile or web app. It includes 12 switches. Free PSD released by Pixeden. 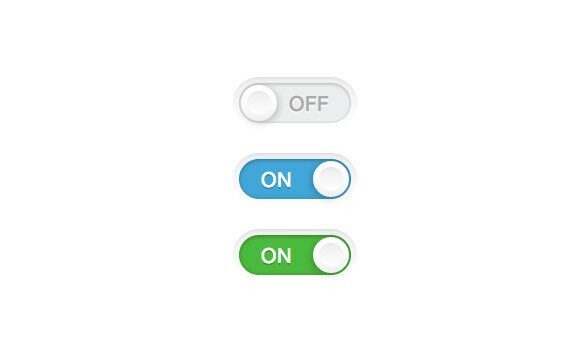 A neat and original PSD toggle switch UI for mobile and web app. The psd includes standard and retina resolution. Source: Pixeden. This free PSD contains vector layers for 3 different knobs and some switches in metal and plastic. Designed by despoth.